Fake news flourishes when partisan audiences crave it. The Economist, April 5, 2018. IMPORTANT NOTE: This ongoing post of recommended reading and resources for teachers will continue to be vetted according to the code of ethics for excellent journalism and the celebration of a totally free press as protected by the First Amendment. I highly recommend bookmarking All Sides ("think for yourself") for an ongoing overall view of controversial issues, from the left, center, and right. FAKE NEWS! It's time for all of us to step up our efforts to fight fake news. Yes, all of us, not just social science teachers and librarians. I've created a reading and resource list to help battle fake news at our school. Feel free to share these resources with your teachers! •Three Historical Examples of "Fake News". Krystal D'Costa. Scientific American, Dec. 1, 2016. •The real history of fake news. David Uberti. Columbia Journalism Review, Dec. 15, 2016. Brief, selected history of fake news from 1807 to the present. •Long Before There Was 'Fake News,' There Were 'Fake Photos'. Angus Chen. NPR, Feb. 5, 2017. •Yellow Journalism: The “Fake News” of the 19th Century. The Public Domain Review, accessed Feb. 23, 2017. A project of the Open Knowledge Foundation. •6 fake news stories in real history. Omaha World-Herald, Apr. 1, 2017. •The Real Story of Fake News from Merriam-Webster Dictionary. •How We Got to Post Truth. Ruth Reader. Fast Company, Nov. 18, 2016. "'The whole flow of the information is a lot more conversational and a lot more decentralized,' says Rich Edmonds, media analyst at the Poynter Institute." •Facebook's fake news problem in one chart. Jeff Dunn, tech reporter. Business Insider, Nov. 18, 2016. •The Future of Free Speech, Trolls, Anonymity and Fake News Online, a research-based study by Pew Research Center. March 29, 2017. •Why do we fall for fake news? S. Shyam Sundar, Distinguished Professor of Communication and Co-Director of the Media Effects Research Laboratory, Pennsylvania State University. The Conversation, Dec. 7, 2016. •VIDEO: How to Fake News - FactCheck.org. 03:22 min. Uploaded by FlackCheck, Dec. 8, 2016. •How Data And Information Literacy Could End Fake News. Kalev Leetaru, data and society analyst. Forbes, Dec. 11, 2016. •The Five Types of Fake News. Dr. John Johnson, author of EVERYDATA: The Misinformation Hidden in the Little Data You Consume Every Day. Huffington Post, Dec. 14, 2016. •Many Americans Believe Fake News Is Sowing Confusion. Michael Barthel, Amy Mitchell, and Jesse Holcome. Journalism.org, Dec. 15, 2016. Includes Pew Research statistics. •How Photos Fuel the Spread of Fake News. Laura Mallonee, arts and international affairs writer. Wired, Dec. 21, 2016. •366 links to understand fact-checking in 2016. Poynter, Dec. 21, 2016. •This Analysis Shows Which Fake News Stories Went Viral In 2016. Craig Silverman, Buzzfeed News Media Editor. Buzzfeed, Dec. 30, 2016. •Fake News and the Importance of Information Literacy. Becky Beville. ProQuest Share This, Jan. 18, 2017. •The agenda-setting power of fake news: A big data analysis of the online media landscape from 2014 to 2016, a study by Chris J. Vargo, Lei Guo, and Michelle A. Amazeen. Published June 15, 2017. Referenced in Study: 'Fake news' has bigger impact than traditional news, by Robert Garrison, of the Denver Channel. June 19, 2017. •Reuters Institute Digital News Report 2017, which includes analysis by country. •How Fake News Goes Viral -- Here's the Math. Scientific American, July 14, 2017. •Beyond 'Fake News' -- 10 Types of Misleading News. Chart from PBS. •Fake Polls are a Real Problem. FiveThirtyEight, Aug. 22, 2017. •Huge MIT Study of ‘Fake News’: Falsehoods Win on Twitter. Robinson Meyer, The Atlantic, March 8, 2018. •The spread of true and false news online. Published study. Science, March 9, 2018. •Can You Believe Your Own Ears? With New 'Fake News' Tech, Not Necessarily (about Fake Audio). NPR, April 4, 2018. •Fake news flourishes when partisan audiences crave it. The Economist, April 5, 2018. •Truth, truthiness, triangulation: A news literacy toolkit for a "post-truth" world. Joyce Valenza, Assistant Professor of Teaching at Rutgers University School of Information and Communication. School Library Journal, Nov. 26, 2016. A gold mine of resources, some of which are mentioned in this post. If you read only one article from this post, choose this one! 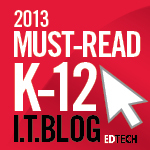 •9 Lessons to Boost Media Literacy. Frank Baker, media literacy expert. ISTE, Oct. 31, 2016. •How to Spot Fake News (and Teach Kids to Be Media-Savvy). Sierra Filucci. Common Sense Media, Nov. 16, 2016. •Skills and Strategies | Fake News vs. Real News: Determining the Reliability of Sources. The Learning Network, New York Times, Oct. 2, 2015. •How to Spot Fake News. Eugene Kiely and Lori Robertson. FactCheck.org, Nov. 18, 2016. •How to Recognize A Fake News Story. Nick Robins-Early, World News Reporter, Huffington Post, Nov. 27, 2016. Nine basic tips, with a postable chart. •Teaching Information Literacy Now. Laura Gardner. School Library Journal, Nov. 28, 2016. •Try These Tools To Spot Fake News. Ann Auman, journalism professor, University of Hawaii at Manoa. Civil Beat, Dec. 1, 2016. •Reading News Across the Political Spectrum. Tasha Berkson-Michelson, Instructional and Programming Librarian at Castilleja School. Association of Independent School Librarians, Dec. 5, 2016. Slide show of resources. •Fake Or Real? How To Self-Check The News And Get The Facts. Wynne Davis. NPR, Dec. 5, 2016. 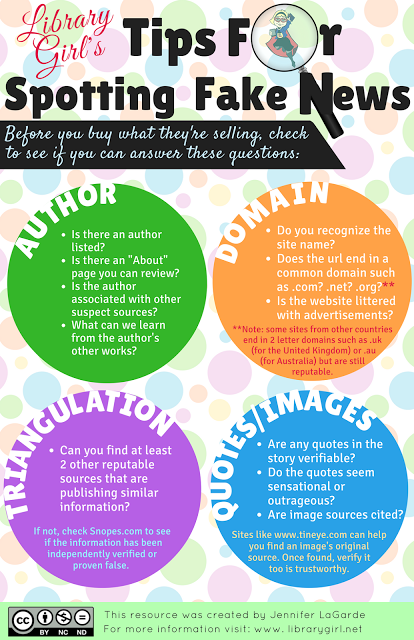 •The Best Tools and Lessons For Teaching Information Literacy – Help Me Find More. Larry Ferlazzo, teacher advice columnist. Dec. 5, 2016. •The Honest Truth about Fake News … and How Not to Fall for It (with Lesson Plan). Matthew Green, The Lowdown, connecting newsroom to classroom. KQED Learning, Dec. 6, 2016. •The Remedy for the Spread of Fake News? History Teachers. Kevin Levin, historian, educator. Smithsonian Magazine, Dec. 6, 2016. •FAKE NEWS vs. REAL NEWS: How to Determine the Reliability of Sources. Northern Essex Community LibGuide, Dec. 7, 2016. •After Comet Ping Pong and Pizzagate, teachers tackle fake news. Moriah Balingit, education writer. Washington Post, Dec. 11, 2016. •A Finder's Guide To Facts. Steve Inskeep, host of NPR's Morning Edition, NPR, Dec. 11, 2016. •Lesson plan: How to teach your students about fake news. PBS, Dec. 13, 2016. 50-minute social studies lesson plan, for grades 7-12. •Battling Fake News in the Classroom. Mary Beth Hertz, HS Art/Tech teacher, PA. Edutopia, Dec. 21, 2016. Ideas across the grade levels. •The Classroom Where Fake News Fails (article). Cory Turner, senior editor, NPR Ed. NPR, Dec. 22, 2016. •Lesson Plan: Fighting Fake News. Rachel Roberson. KQED Learning. 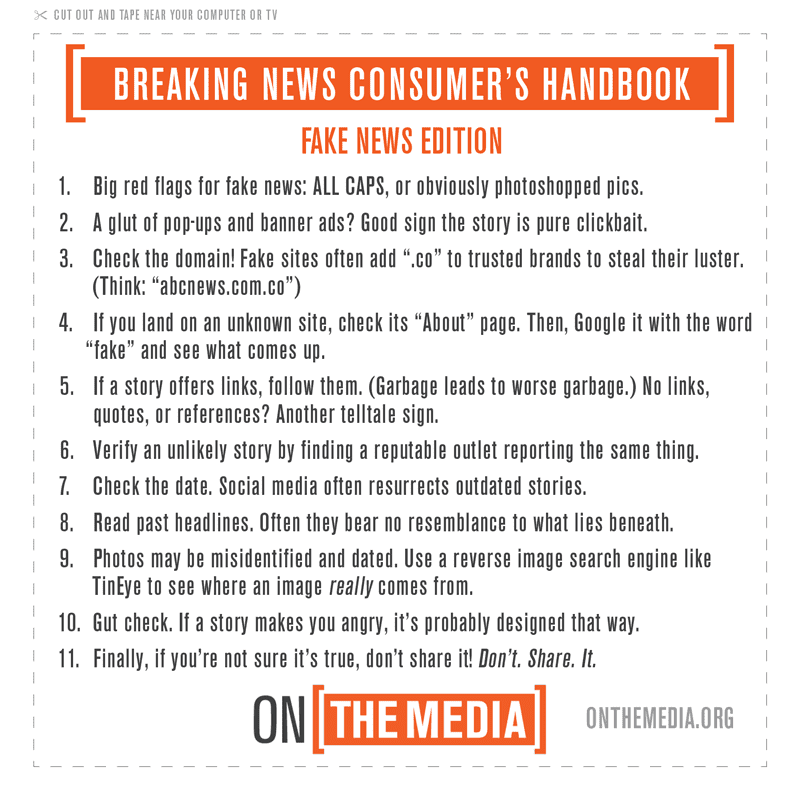 •Breaking News Consumer's Handbook: Fake News Edition. On the Media, Nov. 18, 2016. Interview with Melissa Zimbar, assistant professor of communication and media at Merrimack College, who has "made a list of more than a hundred problematic news sites, along with tips for sorting the truthful from the troublesome. She talks... about how to be a savvy news consumer in a misinformation-filled world." •Lesson Idea: Media Literacy and Fake News. C-Span Classroom, Dec. 27, 2016. Handout and video clips, including the one below. About The Onion, a satirical publication. •Fake News, How to identify and avoid fake news. Indiana University East LibGuide. •Indicators of Trust in the News. The Trust Project. Santa Clara University. •Can Your Students Spot Fake News? Here are 43 Links to Help. Julie Greller, Education Media Specialist, @cybrarian77. A Media Specialist's Guide to the Internet, Jan. 1, 2017. •The Smell Test: Educators can counter fake news with information literacy. Here’s how. Linda Jacobson, education writer. School Library Journal, Jan. 1, 2017. •10 Ways to Spot a Fake News Article. Michele Kirschenbaum. EasyBib, Jan. 4, 2017. 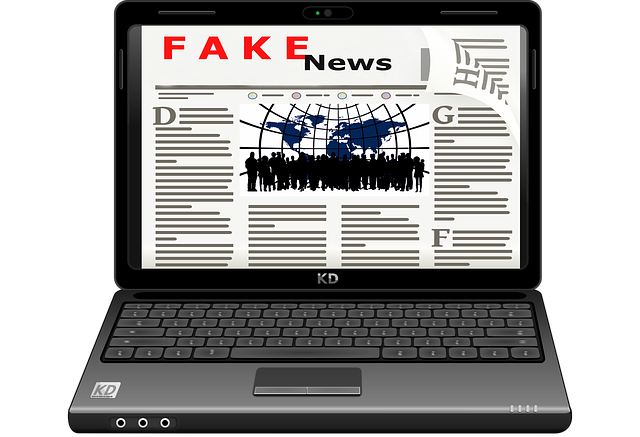 •4 Steps Schools Need to Take To Combat Fake News. Sam Wineburg, Professor of Education, Stanford University. Huffington Post, Jan. 4, 2017. •How Savvy are Your Students? : 7 Fake Websites to Really Test Their Evaluation Skills. Michele Kirschenbaum. EasyBib, Jan. 10, 2017. •InCtrl. "Cable Impacts brings you InCtrl, a series of free standards-based lessons, originally developed by Cable in the Classroom, that teach key digital citizenship concepts. These lessons, for students in grades 4-8, are designed to engage students through inquiry-based activities, and collaborative and creative opportunities." •Our Goal Should Not Be to Teach Kids How to Identify Fake News. Kerry Gallagher, digital learning specialist. Start With a Question, Jan. 18, 2017. •How to Identify Fake News in 10 Steps. Jeff Wyman. Proquest Share This, Jan. 19, 2017. •Evaluating Sources in a ‘Post-Truth’ World: Ideas for Teaching and Learning About Fake News. Katherine Schulten and Amanda Christy Brown. New York Times Lesson Plan, Jan. 19, 2017. •Information Literacy and Fake News. ACRLog ("blogging by and for academic and research librarians"), Jan. 22, 2017. •You're the Fact Checker Now -- How to become a better reader in the age of unreliable newsfeeds. Stanford Alumni, Jan. 24, 2017. •Fake News, Alternative Facts and Librarians As Dedicated Defenders of Truth. Jennifer Lagarde, teacher-librarian. The Adventures of Library Girl, Jan. 25, 2017. Contains downloadable 11X17 PDF of the handy poster below. •Ideas for E.L.L.s: Finding Reliable Sources in a World of ‘Fake News’. Larry Ferlazzo. New York Times Lesson Plans, Jan. 26, 2017. •Will we now take information literacy skills seriously? Doug Johnson, Director of Technology for the Burnsville-Eagan-Savage Public Schools in MN and author of nine books on leadership in schools. Blue Skunk blog, Jan. 26, 2017. •Media Literacy- Fake News- Responsible Research. Audrey O'Clair, Educational Consultant. Padlet collection of resources for teachers and students. 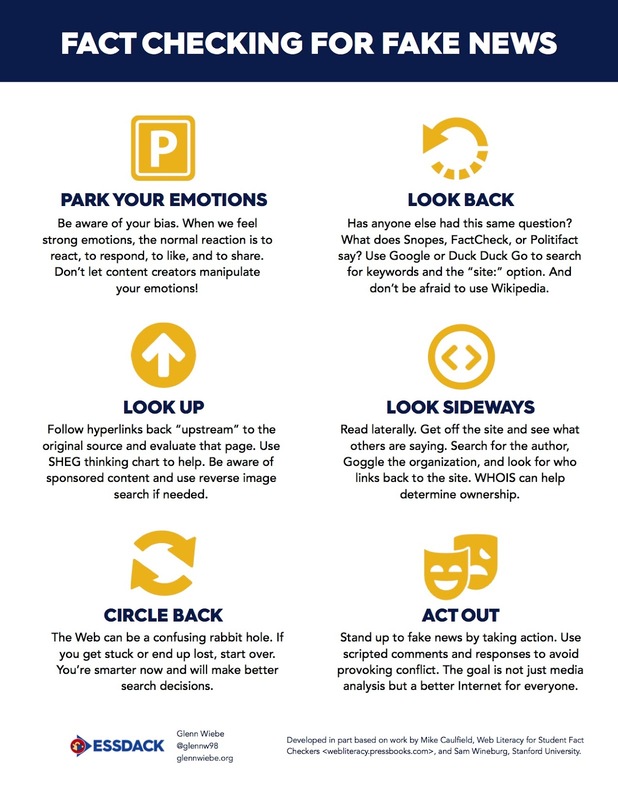 •Identifying Fake News: An Infographic and Educator Resources. Michele Kirschenbaum. EasyBib Guide, Feb. 1, 2107. 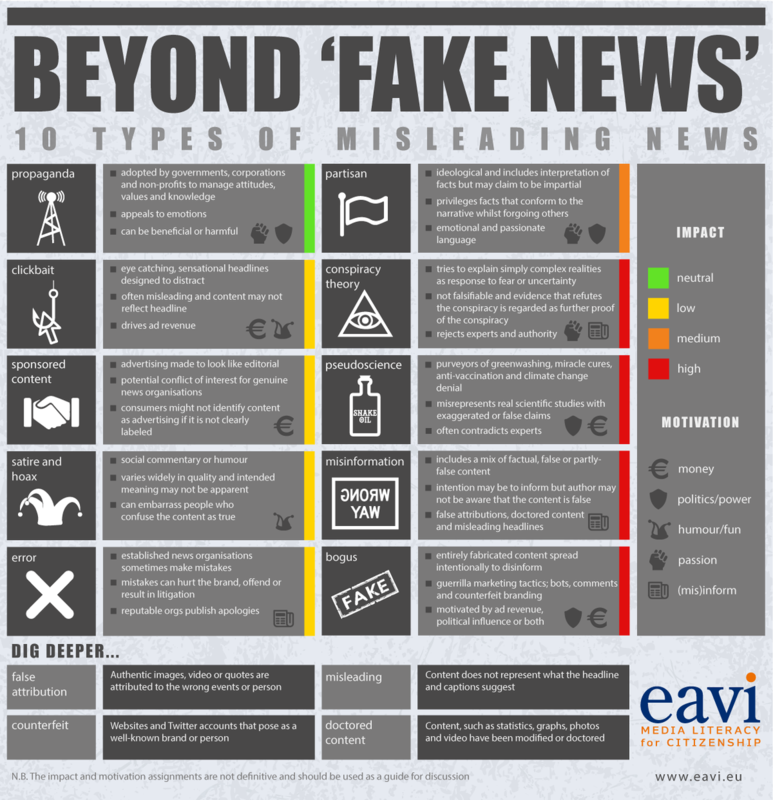 Includes infographic, lesson plan, News Literacy Project's Ten Questions for Fake News Detection, Websites to Test Your Students, and Skills and Strategies: Fake News vs. Real News: Determining the Reliability of Sources. •How to Spot Visualization Lies. Nathan Yau. FlowingData, Feb. 9, 2017. •News Literacy Resources, Lessons and Project Ideas! Shannon McClintock Miller, librarian leader. Van Meter Library Voice, Feb. 11, 2017. Ongoing collaborative Padlet of ideas. •School Library Journal's News Literacy Pinterest Board. 133+ pins, 5k+ followers. •5 Ways Teachers Are Fighting Fake News. Sophia Alvarez Boyd, NPR_Ed intern. NPR, Feb. 17, 2017. •3 FAST, FREE LESSON PLANS TO FIGHT FAKE NEWS. Vicki Davis. Cool Cat Teacher, Feb., 2017. 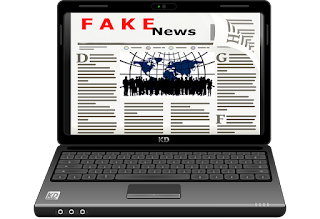 •Fake News: A Library Resource Round-Up. American Library Association Public Programs Office. Programming Librarian, Feb. 23, 2017. •Top 10 sites to help students check their facts. ISTE, Mar. 8, 2017. •On student scrutiny: two strategies. Joyce Valenza. School Library Journal, Mar. 10, 2017. Includes 2 time-tested tools for determining credibility, for (1) high school and (2) elementary and middle school students. •Fake News Resources for Teachers. Julie Smith, Media Literacy Educator, Author. •Fighting Fake News with Google. Linda Lindsay (me). 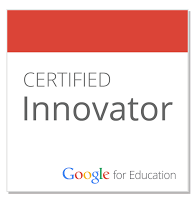 Google Certified Innovator and Trainer. Hawaii Google Summit preso, Mar. 25, 2017. •How to help kids navigate fake news and misinformation online. •To Test Your Fake News Judgment, Play This Game. NPR, July 3, 2017. Game: Facticious by JoLT (Innovation in Journalism Through Game Design) and AU Game Lab (American University). •Real things teachers can do to combat fake news. PBS Newshour, July 12, 2017. •Turning your Students into Web Detectives. Jeff Knutson. Edutopia, Oct. 12, 2017. •The Future of Fake News. Erin Wilkey Oh. Edutopia, Dec. 12, 2017. "New audio and video software will make media manipulations harder to detect. These essential media literacy questions can help." •Digital Literacy for Digital Natives. Harvard Graduation School of Education. Jan. 17, 2018. •Helping Students Find the Truth in a Fake News World. Paul Sanfrancesco. Tech & Learning, Jan. 22, 2018. •FactCheck.org. "A Project of The Annenberg Public Policy Center"
•On the Media. "WNYC’s weekly investigation into how the media shapes our world view. " WNYC. •Media Literacy. "Find and share resources to help students learn to analyze, evaluate, and communicate in a world with countless media sources and constant access to powerful computers." Edutopia. •The News Literacy Project. "... equips students with the tools to be smart, active consumers of news and information and engaged, informed citizens." •Digital Resource Center. Center for News Literacy. •The Trust Project. Markkula Center for Applied Ethics. Santa Clara University. •AllSides. "Balanced news. News and issues from multiple perspectives, respectful dialog." Search the topics and issues HERE. AllSides Dictionary: "A human look at hot-button terms from every perspective" HERE. •Poynter. Collects all of the International Fact-Checking Network's fact-checking articles. •medialiteracynow.org. Classroom "materials and curriculum available online or to order." •Fact Checking, Verification, and Fake News. Lloyd Sealy Library, John Jay College of Criminal Justice, The City University of New York. •Fake News, Misinformation, and Propaganda. Harvard University. •Fake News. Indiana University East. •Search the LibGuides Community yourself. •Fake News. University of Washington. •Portland State University Library LibGuide: Identify and Challenge Fake News. Truth, truthiness, triangulation: A news literacy toolkit for a "post-truth" world. Joyce Valenza, Assistant Professor of Teaching at Rutgers University School of Information and Communication. School Library Journal, Nov. 26, 2016. A gold mine of resources, some of which are mentioned in this post. If you read only one article from this post, choose this one! Will you be tackling fake news and teaching media literacy at your school too? Let me know how it goes! P. S. I posted this news sources chart created by patent attorney Vanessa Otero in our library. We like it a lot, and we're using it as a starting point for discussion about the trustworthiness of news sources in general.